Update to begin: For the present, my wife is working again, though I am taking steps to ensure that we won't be in a spot (and Tekton won't be endangered) if we're left with only my income in the future. Meanwhile, here's an item from the April 2012 Tekton E-Block. Our final entry in this series looks at how the critic who shall remain anonymous addresses what he calls my "muddled and unorthodox" assessment of the P in TULIP (perseverance of the saints). As in past entries, the critic decides to bypass most of what I have written (which is never a wise idea) and discuss only two of my references, those from Hebrews 6 and 10. One thing the critic rightly perceives to start is that my position requires equating the apostasy of Hebrews 6 and 10 with the unforgivable sin of the Gospel texts. After a snide comment equating block logic with contradiction (which shows a remarkable lack of cognizance -- it is equal to paradox, not contradiction), the critic thus begins by attempting to disprove an equation. We are treated first to an extended and unnecessary analysis of all of the texts related to blasphemy of the Holy Spirit (in all three Synoptic Gospels) and uses of the word "blasphemy" throughout the NT. It takes a rather long time before we are given anything of relevance -- six paragraphs, in fact, in which nothing is said which in any sense disagrees with our assessment. The extended description of "blasphemy" doesn't contain anything I'd dispute, but somehow the critic has got the idea, apparently, that i think "blasphemy" means "slanderous speech," though I nowhere say such a thing. Matthew 12:31-32 "And so I tell you, every sin and blasphemy will be forgiven men, but the blasphemy against the Spirit will not be forgiven. Anyone who speaks a word against the Son of Man will be forgiven, but anyone who speaks against the Holy Spirit will not be forgiven, either in this age or in the age to come." The second sentence is key here. The contrast is crystral [sic] clear. It's a speaking sin. The two Greek words for the word "speaks" in this passage are both in the aorist mood. The aorist mood means that "the kind of action is punctiliar. The aorist indicates finished action." Essentials of New Testament Greek Ray Summers (Broadman Press, 1950, p. 66]. This is not a continual rejection of the Holy Spirit or even a continual speaking against the Holy Spirit. It's a speaking sin. The Greek is very clear: Once spoken a person has committed it. This is erroneous. "Speaks" indicates the outward expression of the inner person and so indicates unbelief, per above. It was conventional wisdom of NT era that speech revealed one's heart and testified to one's inner character. Speech and thought were a unified whole in the Jewish mind. The completion of an act of speech is not the same as a permanent decision of the will. The act of speech reflects a condition of the will. The point about the aorist is of no relevance; the only way an act of speech would not be complete (and in the aorist) is if one said, "I deny the...uh...."
Acts of speech usually do get finished. Taking this and the Jewish understanding into account, Jesus' words as recorded in Matthew mean that one who holds to unbelief is characterized by this sort of speech. The Holy Spirit is God's active principle in the world, as the Son (Word, Logos) is the Father's command and direction. By "active principle" we mean that the Holy Spirit is the personified effect of God in the lives of people and in the world...By "blaspheming" the Holy Spirit, Jesus therefore refers to one who denies the divine authority and activity of the Spirit -- as did those who attributed the exorcisms of the story to Beelzebul. ...the beneficial effect of [Jesus'] exorcisms was so self-evidently of God and wrought by his Spirit, that to attribute it to Satan was the worse kind of perversity -- deliberately to confuse the Spirit of God with the power of Satan was to turn one's back on God and his forgiveness (Mark 3:29). In terms of the post-resurrection scenario, this also applies to those who refuse the prodding of the Holy Spirit to believe the Gospel. They deny the activity of the Holy Spirit in prodding them to believe, and thus blaspheme the Holy Spirit by putting his activity down to guilt feelings, etc. This is why we are also told that "whosoever speaketh a word against the Son of man, it shall be forgiven him" -- the Son of man, God's Word and Wisdom, is the message of God; it is not that part of the Godhead which convicts us. Since the critic has thus ignored 80% of my analysis of what this sin is, it is ironic that he says my "failure to understand" all of this "is shocking." Needless to say, it is irresponsible to make such a declaration of a badly understood version of my views. The misunderstanding does not end there, and only gets worse. We are told that "Holding mentions Gal. 5:4 as an example of actual apostasy," but I clearly say, "This is not a threat of damnation due to portended apostasy, but an affirmation of the uselessness of returning to the law for salvation and how it stands directly in opposition to the 'law' of grace." So the critic manages to get from what I wrote exactly the opposite of what I say. And yet we are told that it is MY views that are "muddled". Ironic indeed. And so to the analyses of the two Hebrews passages. For Hebrews 6, I had noted several explanations offered by Calvinists as to why this passage does not refer to throwing away of salvation. MacArthur, for example argued that the passage does not refer to Christians, but I noted that the specific terms used by Hebrews does indeed indicate that it does refer to Christians. The critic admits this to be true, but contrives the convenient explanation that maybe just in this case it happens that the terms are used of non-believers. Needless to say, this is little more than an artificiality. I also noted an explanation that the text was only speaking hypothetically. The critic wastes time wondering what English version I refer to; my note, had he paid attention to it, would have told him that I am not referring to any "English version" but to R. T. Kendall's book on the subject. The critic then switches gears and points out that verse 9 offers a hypothetical: “But, beloved, we are convinced of better things concerning you, and things that accompany salvation, if even we speak like this.” This is interesting but beside the point, as the "hypothetical" subject isn't whether or not salvation can be thrown off, but the desire of the author of Hebrews to encourage the reader/hearer even after having used such strong language. The "hypothetical" of verse 9, which as we have noted is irrelevant. The appeal to God's justice in v. 10 -- which only helps if we beg the question that there is some "injustice" involved in God granting people's requests to leave the covenant. The "restatement of the unshakable promise to Abraham" in v. 13 -- which says a good deal about what is guaranteed for persons in a covenant with God, but says nothing about persons who voluntarily leave it. The "hope mentioned in v. 19" -- though why this makes any difference is not explained. Obviously this hope remains intact for covenant members no matter how many leave the covenant. Finally, we are vaguely assured that "there are plain texts that indicate that salvation can never be forfeited once given" but none are offered, much less explained. That leads us to Hebrews 10, and here the critic literally has nothing to offer but a vague assurance -- buried deep inside a longer analysis which says little if anything -- that the Calvinist interpretation is correct; we are assured that the threat of salvation being disposed of is merely a type of "literary device". Much is also made of the fact that the author of Hebrews refers to "we" as being "not of those who turn back". I hardly disagree, but the critic seems to think that if the author of Hebrews calls himself to be of this group, this somehow negates the relevance of the other group specified with "shrink back into perdition" -- apostates. In close, I am criticized for not having interacted with Matthew 13:18-28. If I did not do so, it is because I found no Calvinist author who did so either, nor any from opposing views who did. That said, I don't consider the passage (which speaks of different reactions to the Gospel) to be specific enough to support either view. Jesus refers to some who "fall away" -- which could be apostates, or could merely be potential converts. Either way, nothing specifically is said of forsaking covenant membership. The critic thinks that the persecuted ones who fall away were never really saved, because the saved bring forth fruit. However, since Paul criticizes believing Christians for not bringing forth fruit, and since Jesus specifies the bearing of much fruit (30-100 times). then if the critic wishes to press the analogy that hard, one could simply remark that the persecuted who fell away, when they were in the fold, produced very little fruit, below the 30-100 fold level. This closes our series on this critic, and I can only remark that I have seen fewer efforts by professed Christians that I consider less competent. 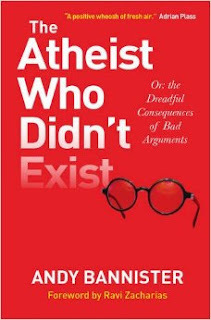 "The Atheist Who Didn't Exist"
We're seeing a bit of light at the end of the tunnel regarding the situation I blogged on last time. Meanwhile I'd like to give props for this item by longtime Tekton reader Andy Bannister, The Atheist Who Didn't Exist. (No, it's not John Loftus!) Read a sample chapter at the link. I'll use this week's Ticker post to alert to some bad news from the Holding household...my wife is now unemployed, and that's a severe blow to our household budget. While we try to get her back into the workforce, Tekton's activities will be somewhat more erratic, perhaps, but in no way curtailed in terms of material produced in a timely manner. At present I am querying some donors about temporarily increasing their support, and also looking for new sources of support. We've been so stingy over the years that we're far from being that "one paycheck away from the street" scenario, but I'm not one to sit by and let things fall by the wayside. For those interested, I have posted a fuller account of what has happened here.